I've put off making meringue cookies for far too long. Plus, these little cookies are highly versatile. To make this batch Christmas-appropriate, I colored them with streaks of red and green and flavored them with white chocolate extract* and peppermint extract. Just think of the possibilities with these little beauts--black and orange on Halloween; red and blue (or the colors of your nation's flag) on any patriotic holiday; orange, yellow, and rusty red for Thanksgiving; and so on and so forth. They're open to any sort of flavoring, too, whether it be coconut (yum! ), almond (none for me, thanks! ), or something citrus like orange or lemon. I love endless alternatives, don't you? *So the white chocolate extract is a little steep, but you'll be using very little of it here and there...and everywhere, if you're like me. Having never made meringue cookies before, I was amazed at how quickly and easily everything came together. I was also quite shocked when I picked one up off of the baking sheet--it was SO light! It's a crunchy, crackly, crispy first bite, and by my fourth or fifth cookie, I had decided that the best method for eating them was to simply pop the whole thing in my mouth and let it break down on my tongue. Yum! Looks kinda like a walnut, no? This is my entry in the Creative Holiday Recipe Contest hosted by Confessions of a Cookbook Queen and Cookies and Cups, two terrific blogs you should intensely examine posthaste! Preheat oven to 200 degrees F and line a baking sheet or two with parchment paper. In the bowl of an electric mixer fitted with the whisk attachment, beat the egg whites on medium speed until foamy. Add the cream of tartar and continue to beat the whites until they hold soft peaks. Gradually add the sugar and continue to beat until the meringue holds very stiff peaks. Beat in the white chocolate and peppermint extracts. Fit a pastry bag with your favorite tip and streak red and green stripes of icing colors along the inside of the bag. I did four streaks, alternating red and green. Pipe small decorative blobs onto the prepared tray(s). The first one may not have much color, but it'll come, I promise! Bake the meringues for 1-1/2 to 2 hours, or until completely dried. So pretty! I love the idea. I've somehow always convinced myself that meringues were super complicated...but I guess not! Those are so adorable, Grace. The colors! Cookie fun. Unfortunately, humidity and meringues do not like each other and I rarely make them if I'm not going to serve them ASAP. We are having hot, humid weather in S. Florida right now. Very unusual this time of year. I LOVE these!! I have only made meringues a few times and honestly I was scared stiff the entire time! Yours are gorgeous :) THanks so much for linking up! I love buying them from the store! I always figured they were difficult to make. Yes I can do these just for the colors. Did I ever tell you how much I love your blog titles? Because I do :) These look soooo beautiful and festive! So pretty. The addition of white chocolate extract sounds delicious! I've always been terrified of meringue. These sound yummy. Never heard of white chocolate extract. Must check it out. I love your new font on your header. These look great, I love the idea of them. I must try making meringues soon! about gossips and web and this is really frustrating. "Light as a feather, stiff as a board" lol lol lol I remember doing that as a teenager. This look yummy and festive! I think you may have inspired me to try meringue cookies again. The two times I've made attempts before they come out tasting eggy. Yuck. Yours look so lovely, it looks like I'll have to get out my whisk and try again. 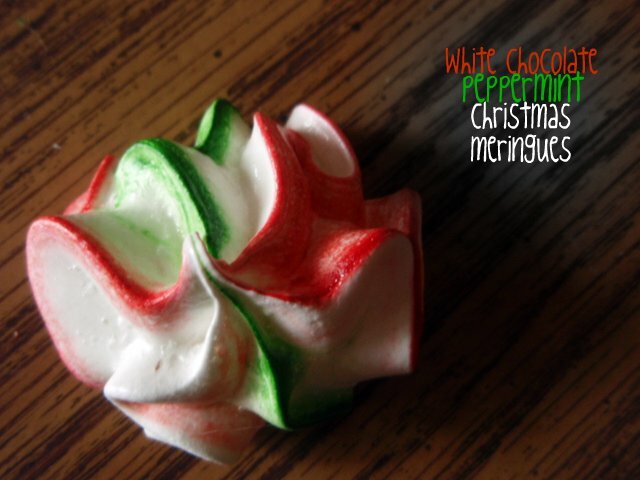 We love meringue cookies here, and yours are beautiful! What a great holiday innovation! Oh these look too pretty. I am almost sure to not get the coloured streaks as perfect as these if I try, i'm sure. I never got to meringues. A victim of being so sick. Now I am jealous. $50 NOVICA gift card giveaway!